“I can’t start saving for retirement!” This was a common statement I heard in my stockbroker days, and one I still hear regularly today. In nearly every instance when I dug beneath the surface the answer is the same – the person believes they can’t afford to start investing money for retirement. They either see the “small” amount they have to start with, or they believe they don’t have the money to spare. I get it. I used to be there myself and it is one of the worst money mistakes I ever made. I believed I couldn’t afford to put money in a retirement account. I thought there was no simple way to save for retirement and allowed inaction to grip me. In reality, it was a behavioral problem and not the amount I was starting with. We all know we need and should be saving for retirement. It’s a universally accepted fact, unless you plan to work ‘til you drop. It takes one look at the math to see the need to start now rather than later. You’ve seen this statistic on the site before, but according to the Center for Retirement Research, if you wait until age 45 to start saving for retirement you will need to put away three times the amount as someone who starts at age 25. Don’t believe me? Take a look at the graph below. 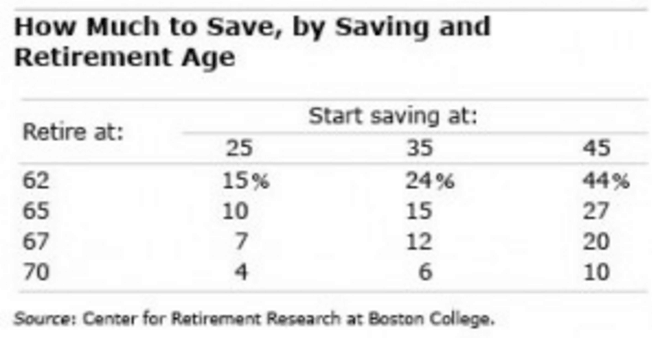 If I plan to retire at 62, then I must put away at least 15 percent of my earnings if I start at age 25. What if you wait until age 45? You must then put away 44 percent of your earnings. However you slice it, that’s a significant chunk of your earnings. Not to mention the fact that you might not even be able to stash away such an amount at age 45 if you’ve not dealt with the underlying behavioral issues that kept you from saving for retirement in the first place. I know 15 percent of your income seems impossible. You see a variety of other areas your money needs to go and give up as a result. This misses two key aspects of investing in the stock market. The first, and most important, is compound interest. You need to give your money time to grow so it can create more money. The second is that you simply need to get started. If that 15 percent amount is overwhelming, start with what you can and build up to a “good” amount. It’s far more important to start investing with little than to hold off until you have more. That being said, don’t allow what you think you don’t have hold you back from saving for retirement. 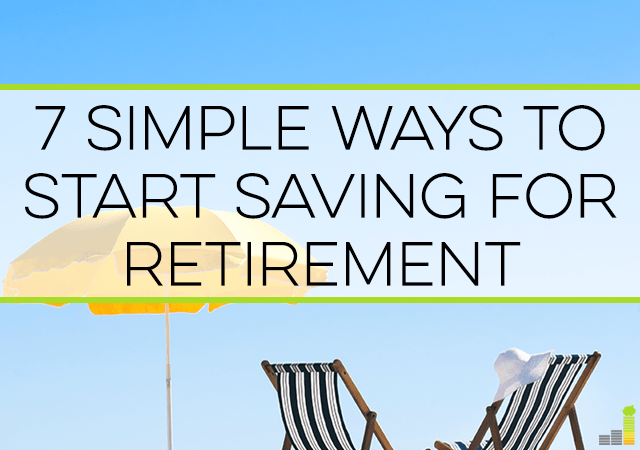 Saving for retirement can be simple, if you manage it wisely. Below are some ways to overcome the fallacy that you don’t have money to save for retirement and simplify it altogether. According to the Investment Company Institute, 52 million Americans have access to a 401(k) plan. If you have access to a 401(k) plan you’re in luck as this is likely the best way to save for retirement. Put away at least enough to get your 401(k) match as that’s free money. Trust me, that $50 per paycheck will serve you much better in the long run instead of being spent on more stuff. If you don’t know what investments to select, or think you could do better with what you’ve selected, Blooom is a great resource to help better manage your 401(k) investments. Blooom is a service that will analyze your plan to see if you’re overlooking lower cost or better performing funds within the plan. Blooom will give you a free analysis of the investments in your plan to lower fees so more of your money will work for you. Blooom does charge $10 per month, but offers a 30-day free trial to help get your 401(k) plan in shape. Not everyone has access to a 401(k) plan. In that instance, you will want to research an online broker for your retirement planning needs. There are a number of online brokers out there, such as Betterment or Wealthsimple that allow you to open a retirement account as little as you want. Open an account and put a few hundred dollars in and start investing. What do you spend money on each month? I’m not even saying you have to budget, but you do need to know where your money is going. Find one thing to cut out completely for one month and see if you truly feel it. It can be eating out. It can be going out for drinks less regularly. Whatever it is cut it out for one month. If you don’t miss it that’s instant money you can divert to saving for retirement. How many things do you have laying around your house going unused? If you’ve not used something in the past year I doubt you’ll miss it when it’s gone. Sell your unused stuff and open a brokerage account with the proceeds. Anyone can make extra money. Many believe they don’t have the skill to earn extra money – don’t give into that myth! There are many ways to bring in more money. You can pick up overtime or volunteer for new duties at your day job. You can get a part-time job. You can start a side hustle from driving for Uber, to walking dogs in your neighborhood to cleaning houses. However you earn it, take that extra money and use it to save for retirement. This is what held me back from saving for retirement. I liked to spend money I didn’t have and it often was on a credit card I had no business using. Think of it this way – each time you swipe your credit card (and you don’t know how you’ll pay for that purchase) you hold yourself back that much more from saving for retirement. Instead, leave the credit card at home…better yet, stay home. You’ll appreciate the freedom later in life far more than that trinket – trust me. What does cooking have to do with saving for retirement? A lot in fact. A recent Marketwatch article reveals that 24 percent of Americans overspend on going out to eat. Worse yet, we have $520 of food waste each year per person. Teach yourself how to cook and you’ll be amazed at how much money you can save. Take those savings and invest it for retirement. The above list barely scratches the surface. There are many ways to save for retirement, but you won’t find them if your behavior doesn’t change. That’s the underlying issue in nearly every instance. When you change that behavior you’ll be amazed at the opportunities to start saving for retirement. I know it likely means less new stuff. But, last I checked, more stuff will do little to provide financial security. Why else do you think people think they can’t save for retirement? What’s one thing that held you back from starting to invest for retirement? When did you first start saving for the future? I’m always shocked when I hear people are not saving for retirement – especially without a good reason. It’s so important to start young. I feel the same way Natalie. I think it overwhelms many, or they think they have little to start with and let it slide by. We didn’t start saving for retirement until our late 20s. We’ve made up for it since then, but I wish we would have started saving much earlier! Yep, we’re in that same spot Holly. I think the idea of investing is really overwhelming for a lot of people. And it paralyzed them with indecision. I actually had a younger co-worker (25 years old) ask me about this last week. I’ll have to send her your post! You hit the nail on the head Kate. Many are just overwhelmed and they let it pass them by. Thanks! We started saving at a faster rate when we realized early retirement was within reach. This has motivated us to cut from our already pretty slim budget. There is often room for savings if you’re willing to evaluate your spending and make a few small changes. I think a defeatist attitude holds people back. It’s such a large goal that people think $10 here and there doesn’t make a difference, but over time that can really add up if you are too nonchalant about your money. You’re exactly right Kalie. It really does come down to a behavioral issue quite often. We think that $10 or $20 will do nothing so we do nothing as a result. When we were really broke — disability and unemployment while paying down medical and student loan debt — I just started having $25 transferred from our primary to our secondary checking account each week. It was a small enough amount that we could work around it. And $100 was at least *something* put away. One of the problems is that people cut a service, and the savings disappear into the ether of their budgets. 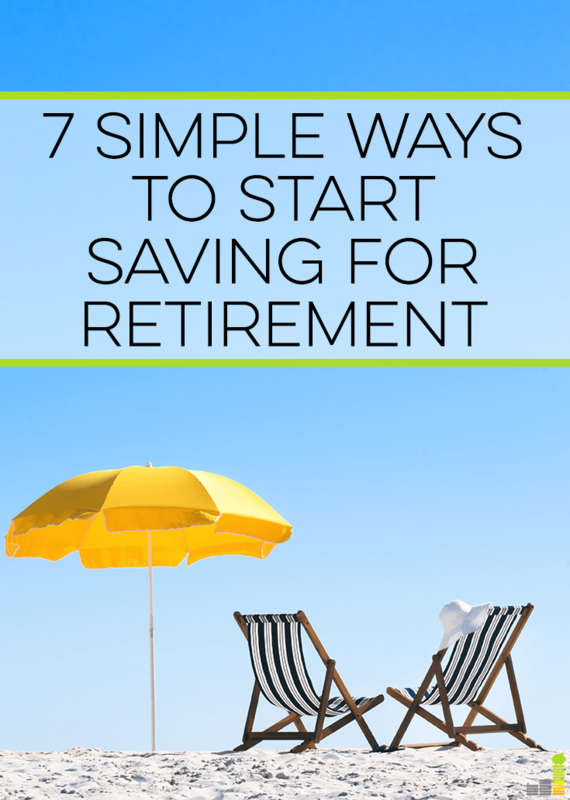 You just need to make sure that money gets put directly into savings or some form of retirement account. That’s exactly it Abigail – you show that it can be done even with modest means and kudos to you for doing it. I’ve seen that happen as well. It’s just viewed as extra spending money and not put elsewhere. I think people believe they will always be able to earn income. I don’t know how many people who’ve told me they plan to enjoy money now and keep on working. The reality is that as you get older, there is greater risk of health problems or losing a job you can’t replace as an older worker. It’s much better to plan for all possibilities, even if you plan to work forever. Exactly Kim! That just goes back to the same short-term mindset. I’d much rather enjoy life a little now but plan so I can do whatever the heck I want when I’m older. The hardest part for me was knowing where to go to start investing and then what to invest in. I started at 23 investing $50 dollars a month. It seemed like all I could do at the time because I was in college but I really didn’t even notice it coming out every month. I think that’s a big issue for many as they’re just starting to think about investing. It can be really overwhelming if you don’t have any experience with it. I do think that some people have so much debt (i.e. student loans) that they literally are having trouble saving anything without living out of a box. In those cases I think your tip of making more money will help free up more $ for investing. I think you’re exactly right DC. There will be some instances where that’ll be the case. That being said, I think behavior holds a lot back – especially if they’re not willing to find ways to make extra money.